Legendary bowhunter and journalist Dwight Schuh, of Nampa, Idaho, was named the 2010 POMA/ATA Fred Bear Archery and Bowhunting Communicator honoree. 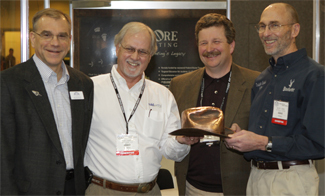 L to R: Jay McAninch, ATA president/CEO, Chris Chaffin, POMA chairman, Bill Miller, POMA president and Dwight Schuh, 2010 Fred Bear Archery and Bowhunting Award Honoree. JANUARY 15, 2010, COLUMBUS, OHIO — Archery and bowhunting industry professionals cheered today when the recipient of the prestigious POMA/ATA Fred Bear Archery and Bowhunting Communicator Award was revealed at the ATA Trade Show in Columbus, Ohio. Legendary bowhunter and journalist Dwight Schuh, of Nampa, Idaho, was named the honoree. Obviously surprised by the announcement, Schuh explained, “I told the guys at our (ATA Trade Show) booth that I had an important meeting at the ATA booth, but no, I had no idea why we were coming over here. Schuh is also one of the most accomplished bowhunters in the world. Over the past four decades, he has taken a total of 23 big game species from across North America and 10 species in Africa with bow and arrow. “From my perspective, Dwight Schuh has been one of the most influential and accomplished media professionals in our industry for the last couple of decades,” said Jay McAninch, ATA president/CEO. “Dwight and I have talked about some of the most difficult issues that affect bowhunting. At the same time, we’ve enjoyed hunting together and being a part of an industry and sport where so many of us have great passion for what we do. I know the 500 manufacturers and several thousand retailers in our industry join me in applauding Dwight’s achievements. He is a very worthy honoree of the Fred Bear Award. Following three years in the U.S. Army in the 1960s, including one year in Vietnam, Schuh earned degrees in English and Journalism and began freelance writing in 1971. For the next 25 years, he made his living as a full-time freelance writer/photographer, having hundreds of articles, columns, and photographs published in all the major outdoors and archery publications. In January 1996, he came on staff full time with Bowhunter, and he has served as Editor since July 1997.  In addition to his editing duties, he writes editorials, for the magazine, and he appears regularly on Bowhunter TV on the Sportsman Channel. 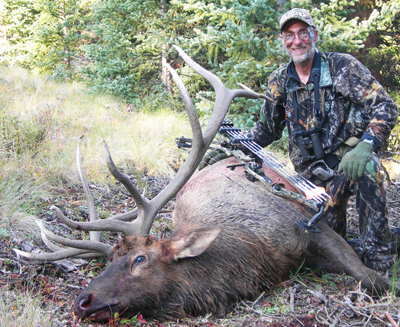 Dwight has written nine books on archery and backcountry hunting, including Bugling for Elk, Hunting Open-Country Mule Deer, and Bowhunter’s Encyclopedia. He also has been featured in several videos, such as Hunting Rocky Mountain Mule Deer, Elk Fever, Buck Fever, and Bowhunter Magazine’s Video Journals. He also lectures extensively at sports shows and banquets. Dwight and his wife, Laura, live near Boise, Idaho. They have two daughters, Emily and Margie, and two grandchildren, Dieter and Margie Ann. Those who communicate the archery and bowhunting story and who are committed to these sports are an integral part of our past, present and future. It’s time they are recognized for what they do for the industry.